Get lost, lost keys - and forget combos for good. 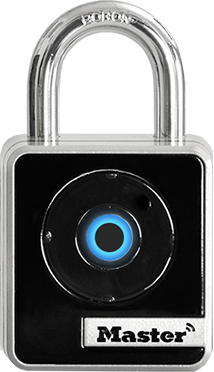 With this Bluetooth® padlock, your key is your phone. Whether you have your phone or not, you're always in control. Have your phone? Touch any button on the lock and open it. Phone not available? Just enter the directional code on your lock keypad. 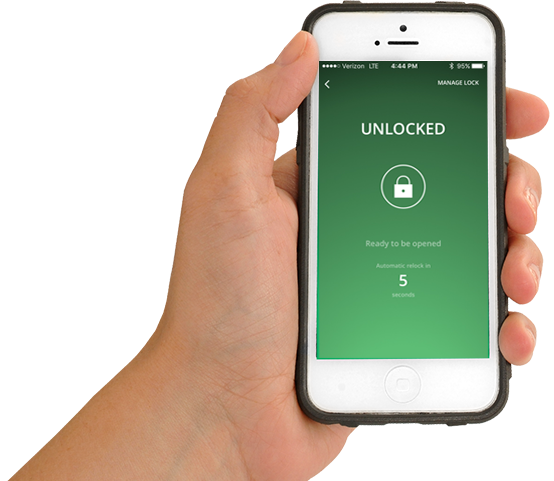 Give people access to your lock without risk of giving out keys or combinations. Simply give them all day access or limit access to day or night. Use your phone to give someone access without having to run home from work. Perfect for when your neighbor's son is ready to mow your lawn. 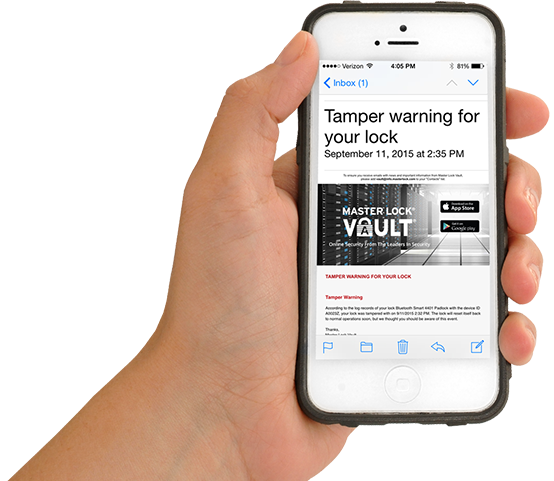 Tamper alerts give you peace of mind while on vacation, so you can focus on what's really important: creating memories with your family. Easily manage your workforce's access to key areas and keep an effortless log of employee entry that you can bring up anytime, anywhere. Lock height (including shackle): 3.06"
Lock height (including shackle): 5.29"
How long will the 4400 series battery last? The 4400 series battery should last at least 2 years in Touch Unlock Mode and 4 months in Swipe Unlock Mode with regular use. How long will the 4401 series battery last? The 4401 series battery should last 5 years in Touch Unlock Mode and 2 years in Swipe Unlock Mode with regular use. What if my lock battery dies? If the lock battery dies while the lock is closed, it can be unlocked using an external battery. See Unlock With External Battery. © 2015 Master Lock Company LLC.